Everyone loves a hot celebrity couple. Perhaps it has something to do with celebrities playing the role of royalty and nobility in this country; or perhaps it is because we love the voyeuristic feel that we get when we comment on their choices. Whatever the reason may be, the fact is that we do enjoy a beautiful celebrity couple. On the other hand, celebrity hookups sometimes feel really nonsensical and frivolous, as if the only reason two celebs hook up is because they spent more than two hours in the same room. Often times, you even get the feeling that their “relationship” is nothing more than a publicity stunt thought up by their PR people. Over the years, we have had myriad celebrity couples, some of which worked out and some of which haven’t. The following ones didn’t, but what is more important, we forgot all about them. In short, you are in for quite a few surprises as you go through our list of forgotten celeb couples. 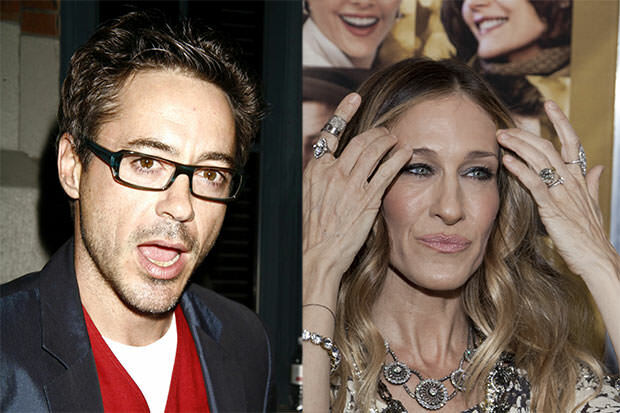 Long before they were Iron Man and Carrie Bradshaw, Robert Downey Jr. and Sarah Jessica Parker were in a relationship that lasted for 7 years. As you might imagine, this is one of the longest relationships on our list (in Hollywood terms that is almost 70 years) and the reason why we think people forgot about it is because it was so long ago. This was back in the period between 1984 and 1991. At the time, only Downey Jr. was a huge star, as Parker was still trying to break through in a really big way, like she did later. Downey Jr. admitted in a number of interviews that it was all his fault the couple broke up. He says that he was drinking too much and doing too much drugs (like there is any other way), which was something Jessica Parker was never interested in.